J.P. Morgan And The Reverse Bailout That Saved The U.S.
Author’s note: Another in a series of obscure American history viginettes. Bush’s multi-trillion dollar bailout was nothing new in American history; the money just flowed in a different direction. In America, where the banking monarchy has long memories and keeps ledger books going back centuries, it was just repayment of a debt incurred before the turn of the last century to a new generation of our financial princes. Things were getting desperate for President Grover Cleveland in the early months of 1895. The U.S. economy was collapsing under the burden of falling prices and rising unemployment that began with the Panic of 1893. Now eighteen months later, millions were unemployed. Without a central banking system and a currency backed by gold, the Treasury’s reserves were dropping too. Normally, the Treasury held gold reserves comfortably above the statutory floor of $100 million. By January 24, 1895, the Treasury has only $68 million. Scarcely a week later was it down $45 million. Nervous investors began to demand gold for their dollars and a run on the Treasury was inevitable. The proposed plan to subsidize the gold standard with silver reserves only made creditors more anxious and the run accelerated. For his part, Cleveland tried to avert the disaster. With his Treasury Secretary, John Carlisle, Cleveland had proposed a plan to sell government bonds to the public to raise $60 million. The rapid run on the Treasury made than tedious process unworkable. The concern at the White House grew when Carlisle confidentially advised the President that the Treasury had gold reserves of $9 million, and that one single investor held a draft ostensibly worth $10 million. Insolvency o f the government was inevitable unless a source of funding could be found – indeed a bailout of the U.S. government was the only hope. 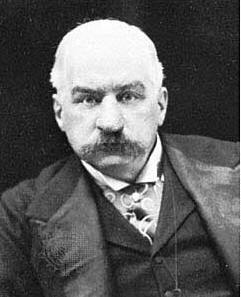 Enter Wall Street financial baron John Pierpont Morgan. Son and grandson of Wall Street bankers, Morgan may have been the most repulsive man on the Street. Suffering from a visage marked by chronic rosacea, Morgan avoided the public eye which only added to his reputation as a secretive, voracious gobbler of railroads and other businesses. Morgan was the original Wall Street shark, swooping in to grab an unsuspecting company and then retreating into the murky waters of finance leaving only the remnants of his presence. Using his financial power to extract concessions from major U.S. companies, he insinuated himself onto scores of managing boards by exchanging forgiveness of debt for seats. He used the knowledge derived therefrom to grow his steel trust into America’s first billion dollar business. Morgan was keenly aware of the Government’s plight, and like all captains of industry saw both danger and opportunity. His financial empire founded on commercial railroad service needed a stable and growing economy. An imploding government was contrary to those needs, and Morgan understood that what was good for the U.S. Treasury was also good for business — his business. Grover Cleveland well-knew Morgan’s reputation, and avoided his offers of help as long as he could. Finding no alternate, Cleveland reluctantly agreed to see him only when reports of Morgan’s trip to Washington eased the run on the Treasury. Perhaps Cleveland could use the banker’s prestige but avoid using his money to save the Country. No such luck. Sitting before an anxious President, his Treasury Secretary, and Attorney General Richard Olney, Morgan was once again presiding over a meeting of another board of directors. To Morgan, the issues were the same – how to save a failing business and avoid disaster for the investors. The President protested that a private bailout wasn’t truly necessary and that he expected an upturn in the economy would save the day. Morgan drolly replied. “If that $10 million draft is presented, [and] you can’t meet it, it will be all over before three o’clock.” Shocked that someone other than the President’s inner circle knew the truth, Cleveland listened. Morgan proposed an immediate private sale of government bonds to Morgan and his syndicate. In exchange, Morgan would give the Treasury the gold it needed ($100 million) to meet its current and anticipated obligations. The President asked if it was legal, and Morgan nonchalantly replied, it was by virtue of a Civil War statute, “four thousand and something.” Olney checked and it was all quite legal – but politically dangerous for the President. The public was none too fond of Wall Street types and Morgan the biggest “type” of them all. Still things were desperate and Morgan assured the President that gold would not be shipped abroad until the goal of the plan was reached. Cleveland said that $60 million would be fine, trying to save some dignity from the situation. Morgan was as good as his word and the bonds were sold and gold filled the Treasury. The run stopped and, as Cleveland predicted, the economy stabilized. Morgan had co-signed for the U.S. debt and like a happy teen with a new car, the economy took off. Morgan now stood to make millions more than he paid. The political price Cleveland anticipated had to be paid. Many on the left contended the President “sold” the government to Wall Street. When Morgan refused to reveal his profits on the deal, the party grew more enraged. At the Democratic Convention the party rallied to William Jennings Bryan who delivered the famous line that mankind was being crucified on a “cross of gold.” He would lose the next three elections. Morgan would go on to bailout both the New York City Stock Exchange and the City of New York in the coming decades, but neither would win him public approval. Indeed, President Teddy Roosevelt centered his “trust busting” canpaign on the insidious network of interlocking boards of directors that created the monopolies which Morgan epitomized. Still, there is no denying that Morgan saved the nation when no one else stepped forward. Whether he did so out of patriotism, profit , or some combination is debatable, but the fact that he did is not. flip flops is useful for rainy weather as these shoes dry quickly. Just being in these surroundings with rough and uneven ground underfoot will require some sturdy and reliable footwear. on hold since completing tasks at work can interfere with care giving responsibilities. SMS previews on the lockscreen can be disabled as well, and even SMS can be filtered to prevent annoying people from contacting you. what do you think of this? Pretty good idea in my book. I think you are wrong about the Fed, they have stolen a great deal of money through their inflationary policies. Rockefeller tried to reduce the price of a gallon of gas/kerosene so he could sell more. Thereby giving people a gift of time. The FED has stolen time from the people by inflating our money and making it worth less. Increasing the amount of time we now have to work for something. So actually you are correct, the “Robber Barons” are not even in the same league as the FED. I would think history of the country’s finances since the introduction of the Federal Reserve System would provide you ample support but if you need more, you can see your own cited paragraph which asserts the rise of numerous banks prevents the harm you complain about. In the U.S., there about 9500 chartered banks with assets over $100M. This does not include foreign banks, other lending institutions, and smaller banks with less assets. Not all are in the Federal Reserve system. This was not Federal Reserve monetary policy at work but the foxes guarding the chicken coops after Phil Gramm et als decided to dismantle Roosevelt’s protections for the average investor. The Fed certainly makes mistakes, but it learns from them, and equating it with the robber barons of old is just plain error. Heres the chapter index for that whole book. Id invite meps to read it too but im not holding my breath. and this is dedicated to the morgans. Here is what bankers could not do when currency was pegged to gold and reserves were at 100 percent. Everything may be fine and profitable for the Rothbard Bank for a brief while, but there is now one enormous fly embedded in its ointment. Suppose that the Rothbard Bank creates and lends out fake receipts of $1,000,000 to one firm, say the Ace Construction Company. The Ace Construction Company, of course, is not going to borrow money and pay interest on it but not use it; quickly, it will pay out these receipts in exchange for various goods and services. If the persons or firms who receive the receipts from Ace are all customers of the Rothbard Bank, then all is fine; the receipts are simply passed back and forth from one of the Rothbard Bank’s customers to another. But suppose, instead, that the receipts go to people who are not customers of the Rothbard Bank, or not bank customers at all. Suppose, for example, that the Ace Construction Company pays $1 million to the Curtis Cement Company. And the Curtis Cement Company, for some reason, doesn’t use banks; it presents the receipt for $1 million to the Rothbard Bank and demands redemption. What happens? The Rothbard Bank, of course, has peanuts, or more precisely, $20,000. It is immediately insolvent and out of business. More plausibly, let us suppose that the Curtis Cement Company uses a bank, all right, but not the Rothbard Bank. In that case, say, the Curtis Cement Company presents the $1 million receipt to its own bank, the World Bank, and the World Bank presents the receipt for $1 million to the Roth-bard Bank and demands cash. The Rothbard Bank, of course, doesn’t have the money, and again is out of business. Given the federal reserves power to coordinate interest rates and the rate of unbacked credit expansion, the government has handed the economy of the entire nation into the hands of the very people it claimed to have saved us from by creating it. It is a truly sad farce when the bush and obama administrations facilitated the transfer of taxpayer money to the very institutions responsible for the collapse of the purchasing power of that self same currency. They were bascially printing the money they were bailed out with anyway, only now doing it in public view with everyone assuming it proper and neccessary. I cannot divine the intent of the Rockefellers and Morgan. I can only state that the Federal Reserve system did greatly diminish the need to turn to these folks in times of trouble. On the issue of victimhood, I would say being forced to accept unwanted help would qualify the goverrnment for this status. You might argue that it got what it deserved, but since “it” is “us” I fail to see how “us” didn’t take the shaft our representatives set us up for. that was a fascinating article. Thank you for posting it. But I am not sure I understand why it was so important to have a central bank? It seems they had a faulty premise about the nature of capitalism. Ricardo is mentioned and so is Say. I don’t know for a fact but I believe Say would have been the better economic model. Ricardo apparently was a proto-progressive. It is also interesting that we have been following these false premises for over a hundred years now. It would take a monumental effort to restore true capitalism. No one knows what it is anymore. A true gold standard prevented the early industrialists and captains of industry from what? That is what I am not clear on. Apparently they thought it limited their profits but why would anyone want inflated profits? Or they thought the periods of boom and bust were bad, but as the article mentioned the period before the Civil War was fairly stable and the introduction of “greenbacks” lead to the economic instability of the post Civil War years. What do you think our chances of getting back to a true gold standard are? In light of that article, if it is true, we are truly a socialist/fascist country. Rather sickening to realize that we are the cause for much misery in this world. Albeit not as our progressive counterparts would admit to. As I have said before Neo-Cons are nothing but warmed over progressives. It would seem this article can lead one to that conclusion. I fail to see how the government was a “victim” when it established the disastrous policies which precipitated the crash. Also given that the federal reserve was exactly what the rockefellers and the morgans wanted and needed to coordinate inflation evenly across the banking industry nationally, I clearly fail to see how its establishment somehow protected us from their predations on our currency? If you read the article i provided you would see that it was the morgans and the rockefellers themselves manufacturing the call for a federal reserve. It seems rather counter intuitive that they would try so hard to drum up intellectual and political support for something you seem to believe would have greatly dimished their influence and power? Along with the factors you cited, the lack of a central banking system left the government on its own and victim to financiers like Morgan. As you mention, this was the beginnings of a call for the Federal Reserve System with a government appointed chairperson as its head. JP Morgans motivations for bailing out the feds, was two birds with one stone. You establish a veneer of legitimacy to your cartelization of the banking industry, and you solidify whose interest the feds are going to protect and enforce. He bought an intellectual smokescreen and hired muscle at the same time. “The most interventionist of the Civil War actions was in the vital field of money and banking. The approach toward hard money and free banking that had been achieved during the 1840s and 1850s was swept away by two pernicious inflationist measures of the wartime Republican administration. One was fiat money greenbacks, which depreciated by half by the middle of the Civil War. These were finally replaced by the gold standard after urgent pressure by hard-money Democrats, but not until 1879, 14 full years after the end of the war.